This is the type of trophy fish Punta Cana fishing can produce. This Atlantic sailfish was caught on a charter boat that fished off the coast only 10 miles or less. In some cases you can see the beach goers enjoying themselves on shore while you are in the fight of your life with a giant billfish. One of the great things about fishing in Punta Cana is that the fish are so close to shore and your run time to the top Punta Cana fishing grounds is usually less than 30 minutes. Fishing in Punta Cana means you will be fishing on the east coast of the Dominican Republic and is considered one of the most attractive international fishing destinations in the entire Caribbean. This sport fishing region of the Dominican Republic, going from the southern end to the north is composed of popular sportfishing destinations like Cap Cana (Juanillo), Punta Cana, Cabeza de Toro, Bavaro, El Cortecito, Arena Gorda, Macao and Uvero Alto. 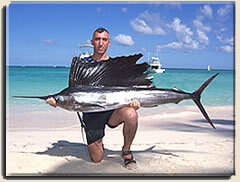 Punta Cana fishing offers visiting anglers many many fine species of beautiful big game sportfish. First Class Fishing runs charters year round and many days we run multiple charters with up to 4 fishing boats. Even though the fish are plentiful, if every charter boat service around the entire island of the Dominican Republic kept all their sport fish they caught we would damage the ocean food chain and place a strain on the big game fish population. That is why First Class Fishing as a Punta Cana fishing charter service practices catch and release if at all possible. Yes the fishing in Punta Cana is spectacular and our customers want to keep some fish and they are welcome to do so but when we catch more than enough then it is very wise to release the rest and preserve the species. First Class Fishing is one of the very few Dominican Republic charter fishing outfits to practice catch and release and we are very proud to conserve and protect the beautiful big game sportfishing reources in our oceans. In Punta cana we practice several water sports and obviously one of the most common is our deep sea Punta Cana fishing charters. 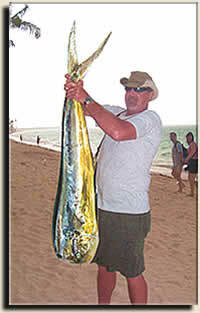 Charter fishing in Punta Cana is regulated to within 2 to 10 miles from the beach. In most anglers home towns 2 to 10 miles just doesn't get you to where the big fish are but in Punta Cana the big game billfish are in very close to shore. You will likely catch large tuna, marlin, or other exciting big sport fish while you can still see the beautiful white sand beaches. Punta Cana sportfishing for the various species is accomplished by using a wide variety of fishing styles and techniques. 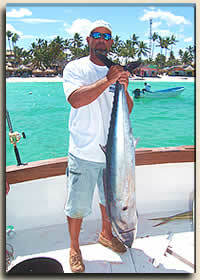 Our Captains are very knowledgeable and have many years experience fishing off the Punta Cana coast. In fact our Captains have been fishing in the Dominican Republic their entire lives since they were kids and there just aren't very many professional Captains that have the amount of experience that our Punta Cana charter boat Captans have. Our Captains and Mates are experts at rigging baits like ballyhoo which tuna and marlin will eat like candy. They use other rigs and lures from bucktails to other plastic lures that will raise fish and get you many knockdowns until one takes the bait and the fight is on. A happy angler is back on the beach after a long day of Punta Cana charter boat fishing. This picture of this beautiful mahi mahi specimen will surely be shown to all his buddies upon his return home. Check out the wahoo this Punta Cana fishing charter put this angler on. And talk about a tropical fishing paradise, just look at that beautiful background. Make your reservation today. Come on and book your Punta Cana fishing trip and come fishing with us today. We would love to have you!